Blue light when charging or in use. Our blue indicator light lets you know when in use or charged and includes a charging base, foil cutter, and 2 wine stoppers all of which conveniently stores in the base. 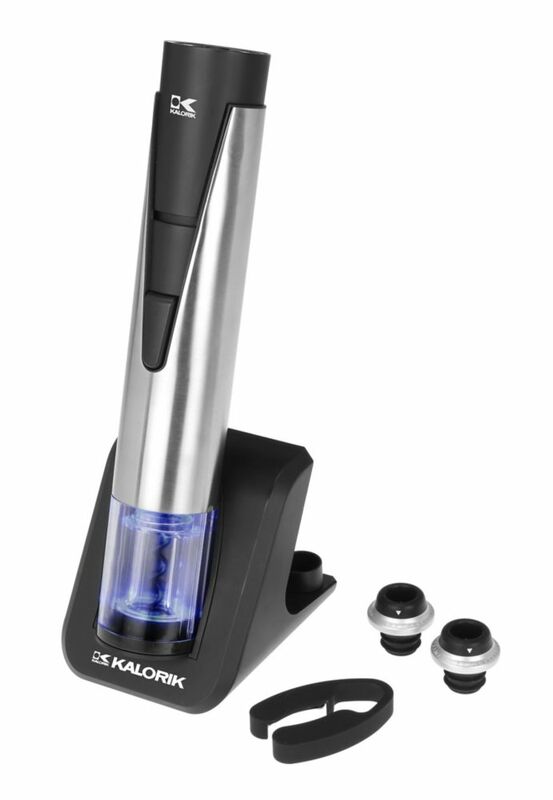 2-in-1 Stainless Steel Wine Opener and Preserver The Kalorik 2-in-1 Wine Opener and Preserver makes enjoying and keeping your favorite bottles fresh and accessible, time and time again. This high-tech, rechargeable, and cordless electrical opener and preserver is both functional and stylish with its brushed stainless steel housing and easy to use operation. With a single charge you can seamlessly open and vacuum seal bottles of all shapes and sizes. The cork is automatically removed and released in a matter of seconds, in addition to removing excess oxygen from within to avoid oxidation and keep your wine fresh! Just press down on the bottleneck to open up to 30 bottles and seal another 50 on an 8-10 hour charge. A must have for the wine connoisseur in your life! 2-in-1 Stainless Steel Wine Opener and Preserver is rated 5.0 out of 5 by 2. Rated 5 out of 5 by Jcubed from Had it 1 week. Performs as expected. Like being able to vacuum seal opened bottle. Had it 1 week. Performs as expected. Like being able to vacuum seal opened bottle.